Getting to Subic Bay is easy, as it is well served by modern expressway routes from Manila and Clark. Hop on a bus, or come by car – if you leave early you can still arrive in time for diving! 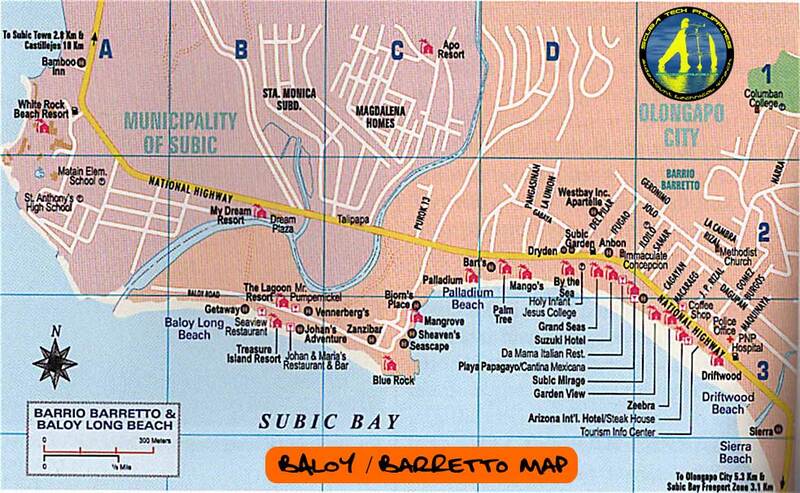 The main areas for western-orientated resorts and diving are Barrio Barretto and Baloy Beach. This is a prime beach-front tourism area, close to Olongapo City and adjacent to SBMA. It is within walking distance of many restaurants, resorts, hotels and nightlife. 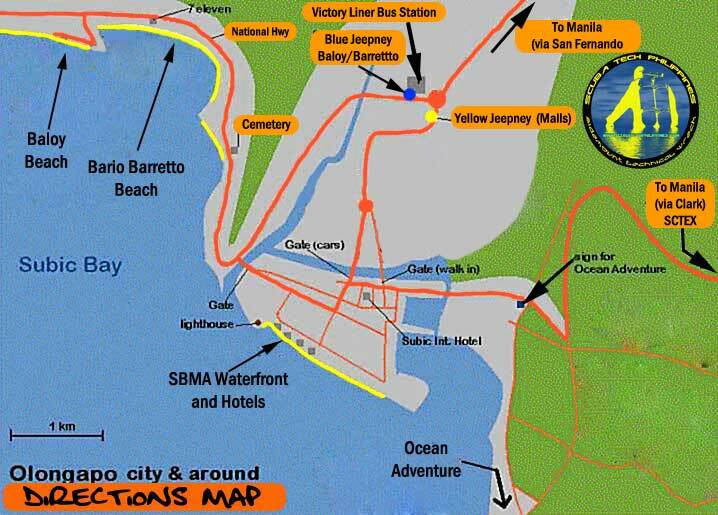 The easiest way to reach these areas from Olongapo City is via a 10 minute taxi or trike ride. There are resorts along the Barrio Barretto beach (between the National Highway and the beach) or along Baloy Beach (turn left along the coast road just after Barretto). Your taxi or trike driver will probably know of your intended resort and the route is direct. Expect to pay approx 500php (taxi) or 150php (trike) – but also expect to be quoted much higher initially… negotiate a fair price! (see my Philippines Travel Advice page for advice on over-charging). Alternatively, you can catch a local ‘Jeepney’ from outside Olongapo Bus Station. The blue coloured jeepneys all run a standard route that passes along the Barretto resorts and past the top of Baloy Beach Road (you can catch a trike from there to any of the Baloy resorts..20-40php). The jeepney costs 15php, but is cramped if you have luggage. You can fly into either Ninoy Aquino International Airport (NAIA), in Metro Manila, or Diosdado Macapagal International Airport (DMIA), known commonly as “Clark Airport”, near Angeles City, from a wide range of global and regional locations. You can self-drive, negotiate a taxi or hire a private car/van with driver through most hotels or resorts. 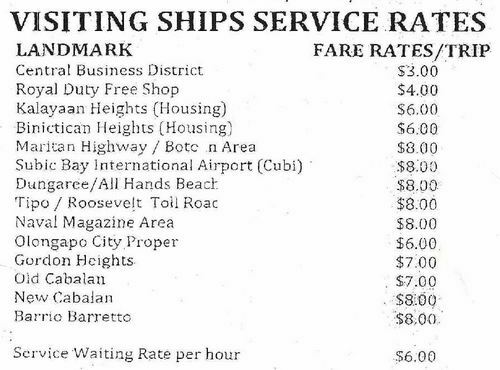 Cost to hire taxi/driver should be approx $100/4200php each way. Getting to Subic Bay should take 2.5 to 4 hours, entirely depending on the traffic in Manila (which can be grid-locked). Proceed north through Manila via the EDSA primary road, until you reach the junction with the North Luzon Expressway (NLEX). Follow the NLEX directly to Clark/Angeles and then turn onto the Subic-Clark-Tarlax Expressway (SCTEX), which leads directly to SBMA. Catch a taxi from the airport, or your hotel, to the Victory Liner bus station on EDSA Pasay. 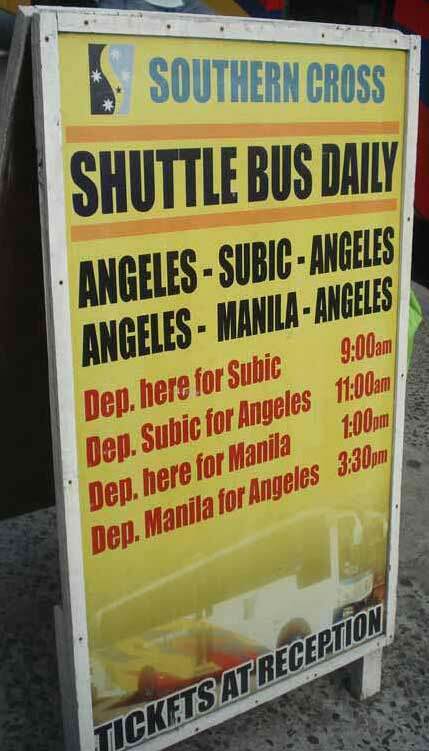 There is a direct bus service from Manila to Olongapo that leaves every 30 minutes from early AM to late PM. The journey takes approx 4 hours and costs ~230php. Buses are air-con (can be too cold – bring a sweater! ), have on-board WIFI, often play DVDs and are generally comfortable. There are no toilets on-board, but there is a rest stop mid-way. On arrival in Olongapo City, you will encounter numerous taxi and trike touts. Negotiate the short trip to your resort/hotel in Subic Bay with them. The connection trip to Baloy Beach/Barrio Barretto areas should cost approx 500php (taxi) or 150 (trike). If adventurous and travelling light – you can also catch a local ‘Jeepney’ from outside the bus station. These are blue colored and travel along the National Highway through Barrio Barretto. A single way trip costs only 15php… but the Jeepney’s are cramped and crowded. You can self-drive, negotiate a taxi or hire a private car/van with driver through most hotels or resorts. Cost to hire taxi/driver should be approx 2800php (car/taxi) to 3200php (van) each way. The journey should take less than an hour, via the Subic-Clark-Tarlax Expressway (SCTEX), which leads directly to SBMA. Most resorts/hotels can arrange private car or van – contact them in advance to book. Southern Cross also run an Angeles – Manila route, enabling travel between Manila – Subic. ANGELES – SUBIC : Departs Swagman Resort on Mon/Wed/Fri/Sun (1o:00 am) Drops at any Subic Resort. Swagman also run an Angeles – Manila route, enabling travel between Manila – Subic, along with routes to Puerto Galera, Baguio and La Union. *Swagman Travel Office Olongapo is on Magsaysay Street. Catch a trike/taxi there from your resort/hotel or ride the yellow jeepney into Olongapo, then change for a blue jeepney to Magsaysay Street. Catch a taxi from Clark airport, or your hotel, to the Victory Liner, Mabalacat bus terminal, at Dau . There is an hourly bus service from Dau to Olongapo/SBMA – it is best to confirm the schedule in advance. The journey takes approx 1 hour. Buses are air-con, often play DVDs and are generally comfortable. There are no toilets on-board and no rest break en-route. Cost is approx 100php each-way. On arrival in Olongapo, you will encounter numerous taxi and trike touts. Negotiate the short trip to your resort/hotel in Subic Bay with them. The connection trip to Baloy Beach/Barrio Barretto areas should cost approx 500php (taxi) or 150 (trike). If adventurous and travelling light – you can also catch a local ‘Jeepney’ from outside the bus station. These are blue colored and travel along the highway through Barrio Barretto. A single way trip costs only 12-15php… but the Jeepney’s are cramped and crowded. The YELLOW painted jeepneys run from Olongapo Town to Subic Town (to the west). They follow a route along the National Highway, taking them through the Barretto and Baloy beach areas. They depart from the side street next to Olongapo bus station (next to the 7-11 store) and will drop-off on demand (simply ask ‘parah’ = stop). Typical cost from Olongapo to Barretto/Baloy is 12php. To get from Baloy/Barretto to the waterfront/boardwalk area of SBMA, simply ask the yellow jeepney to drop-off at ‘Kalaklan‘ gate/bridge. Cross the bridge on foot. It is only a 4 minute walk to the seafront area from there. Alternatively, there is a taxi stand on the SBMA side of the bridge. It is also a 10 minute walk from the gate to the new Harbor Point mall, that is next to the Olongapo vehicle gate (north SBMA). The BLUE painted jeepneys run through Olongapo City to the main gates with SBMA (adjacent to the large SM Mall). You can catch these on the main road in front of the bus station (where the roundabout/rotunda is). Typical cost from outside the bus station to the SBMA gate/SM Mall is just 8php. There is no jeepney service allowed inside of SBMA / SBFZ. Trikes are plentiful in any urban area in the Philippines. You can catch a trike anywhere in Olongapo, Barretto or Baloy. There is always a queue of them touting for passengers – especially when you arrive at the bus station in Olongapo. Trikes are ‘supposed’ to charge about 7php per km, but tourists are unlikely to ever get that rate (or even close). It is best to always tell the trike driver what you will pay for a given journey. If you ask, then you may get quoted a ludicrous amount and they will then remain inflexible in that figure. Taxis are plentiful around the Olongapo bus station and inside SBMA / SBFZ. They are significantly more expensive than trikes/jeepneys and often over-charge. 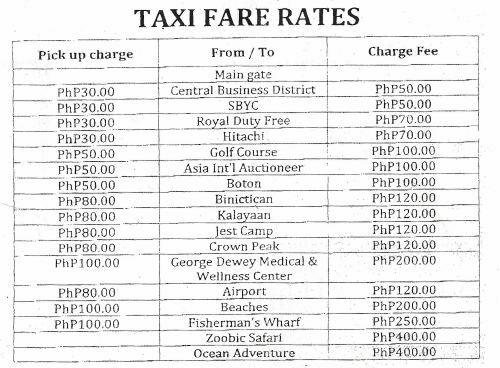 There is no meter requirement on taxis in the Subic Bay area – so you have to negotiate charges in advance. Pre-agreed US Navy rated for journeys from SBMA / SBFZ to outside locations around the Subic Bay area.